* If 40% or more of the students in your program qualify for free or reduced lunch, you are eligible for this discount. ** Innovation Labs take place in select exhibits and have limited capacity. Please see www.thetech.org/innovationlabs for schedule and capacity details. Payment is due three (3) weeks after reservation is confirmed. Please ensure that your student counts are accurate. No refunds will be issued for unused general admission and IMAX tickets. IMAX Snack Pack must be ordered in advance. Includes small popcorn, juice box and a treat. Free admission for one chaperone per eight students. Additional chaperones that are not accounted for on the teacher invoice will be charged the group admission rate. The IMAX theater will be closed for renovations from July 1, 2018 through the end of November. Step 1: Download and read our Planning and Booking Your Field Trip guide. Step 2: Check field trip availability on this calendar, then book using our Request a Field Trip form (we no longer accept field trip requests by phone). Reservations are required at least two (2) weeks in advance for museum admission. Three (3) weeks in advance for Science Labs and IMAX Educational Films. After you submit your request, a Group Reservations specialist will follow up by phone within four (4) days to confirm details and accept payment, which is due three (3) weeks after booking. Step 3: To learn about procedures, policies and tips for a successful field trip after you have booked, download and read our Making the Most of Your Field Trip guide. To help explain to parents what they can expect their children to see in Body Worlds Decoded, which includes real human bodies, download this fact sheet. Field trip requests must be submitted via our online application. A Group Reservations specialist will follow up within four (4) days to reserve, confirm details and accept payment. 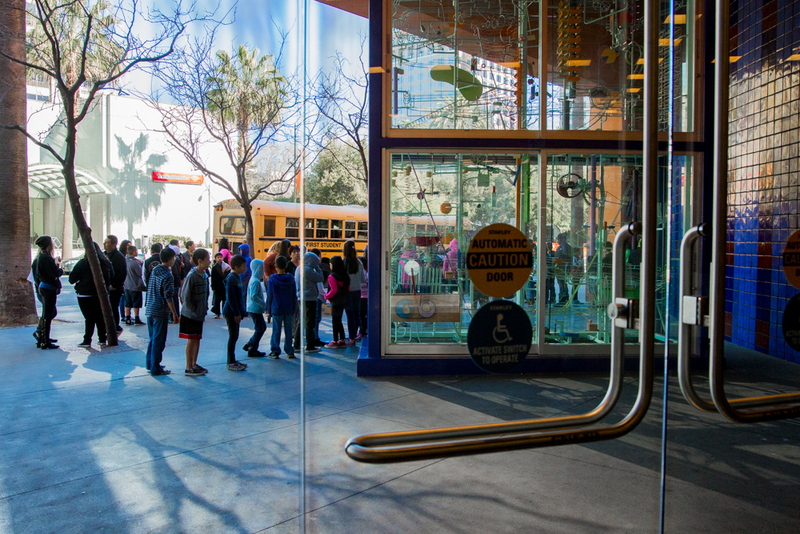 The Tech no longer takes field trip requests by phone. Lab reservations and IMAX educational films required at least three (3) weeks advance notice; all other options require two (2) weeks notice. A $50 deposit per lab is required for Title I schools receiving a Science Lab scholarship. The deposit will be refunded at the time of your field trip check-in. If you cancel your lab less than three (3) weeks before the scheduled date, your deposit will not be refunded. Funding is limited — book early! Payment in full is required three (3) weeks after your reservation is confirmed, or immediately if you have booked less than three (3) weeks before your field trip date. The Tech accepts cash, checks and all major credit cards. To pay by credit card, call 1-408-294-8324, option 3. If you need to change the date of your field trip, please call Group Reservations (1-408-294-8324, option 3) as soon as possible to reschedule. Keep in mind that the lab or IMAX film scheduled for your original date may not be available on your new date. If reservations need to be canceled, please let us know as soon as possible via phone (1-408-294-8324, option 3) or email (groupreservations@thetech.org). *If your trip is canceled within three (3) weeks of the reservation date, payment will not be refunded. If your school is designated as Title I (meaning 40 percent or more of students receive free or reduced-price lunch) admission is free and subsidies are available to help with other costs. See below for options, or call Group Reservations at 408-294-8324, option 3. All designated Title I schools will receive subsidized entry for students and chaperones. Entry includes all gallery experiences and floor programs. Title I schools may qualify for a scholarship for a Science Lab, which covers the entire cost of the lab experience. To qualify for a Title I lab scholarship, teachers must implement the provided pre-visit and post-visit activities with their class and respond to a follow-up survey from The Tech. Download pre-visit and post-visit activities at thetech.org/sciencelabs. A $50 deposit per lab is required for Title I schools. The deposit will be refunded at the time of field trip day check-in. If you cancel your lab less than three (3) weeks from the scheduled lab date, your deposit will not be refunded. Funding is limited — book early! Innovation Labs are available at no cost to all school and after-school groups regardless of Title I status. Reservations are required. If your school group has booked a Science Lab, you are not eligible to reserve an Innovation Lab. Title I schools are eligible for reduced pricing of $6 per student and $6 per chaperone for educational films in the IMAX Dome Theater. Funding may be available for bus transportation to The Tech for Title I schools. Such funding is very limited and may only be available for certain counties; please inquire at time of reservation.